The first thing an angler will need to go fishing in any coastal body of water is a NC Coastal Recreational Fishing License (CRFL.) This applies to all anglers over the age of 16 who want to fish along the beaches, in the sound, or in any waters that are designated as coastal or joint waters of North Carolina. This does NOT apply to charter fishermen, as charter boats typically have universal licenses that cover everyone on board. Visiting anglers can pick up a fishing license online through the Division of Marine Fisheries website at http://portal.ncdenr.org/web/mf/recreational-fishing-licenses-and-permits, and can also stop by virtually any bait and tackle shop along the Crystal Coast to pick up a fishing license in person. Surf fishing is easily one of the most popular types of fishing along the Crystal Coast, as it can be enjoyed along any stretch of the shoreline. What an angler can catch is heavily dependent on the season, but because the Labrador Current and the Gulf Stream collide just offshore, a wide variety of migrating game fish can make an appearance in the close-to-shore waters. In the spring months, anglers can cast for sea bass, striped bass, bluefish, and red drum off the shoreline, as well as king mackerel which make seasonal spring and fall appearances. The summer months bring in a mixed bag of species, including coveted cobia, amberjack, Spanish mackerel, and pompano, which can be landed all along the beaches, and especially near the inlets in the early morning and evening hours. The fall months are known as peak fishing season for surf fishermen, and anglers can expect to find fat red drum, puppy drum, flounder, sea mullets, spot, black drum, croaker, and an occasional sheapshead. Many anglers attest that October is the prime fishing season, as the migrating drum make their semi-annual run along the coast, resulting in huge (and tasty) catches. For a different kind of fishing experience that’s no less fruitful and exciting, visitors can head to the Back and Bogue Sounds where the saltmarshes and clam flat waters serve as the breeding grounds for a wide variety of species. The marshes are a good place to start for visitors who want to wade out and cast a line, and can be home to oysters, juvenile fish, and even larger species like bluefish, Spanish mackerel, and flounder, depending on the season. A kayak comes in handy for covering the sound waters in-depth, and bug spray and waders are a must for fishermen who want to explore. Anglers can access the marshes via the soundside of the Fort Macon State Park, or via either sides of the high-rise bridge to Emerald Isle. In addition, Harkers Island has several public soundside beaches close to the main bridge that leads to the Island, (AKA Harkers Island Road), and the Newport River is home to a popular and well-stocked fishing bridge that’s found in between Morehead City and Beaufort. Visitors who want to cover a lot of ground and head right for the best fishing spots can also charter an inshore fishing trip. Inshore and nearshore fishing charters stick close to the land, (generally venturing about 5 miles out at most), and head to inshore waters on both the ocean and soundside of the Crystal Coast. Less expensive than offshore charters, due to smaller vessels and less gas required to access the good fishing spots, a half day or full day fishing trip can include great catches as well as sightseeing, wildlife watching, and even shelling or clamming. There are a number of inshore fishing charters to choose from, but visitors might want to start their search by perusing the options in Harkers Island. This destination has a long history of fishing and hunting, and there are a solid half dozen inshore charter businesses that are commandeered by locals who have been fishing the area waters for generations. There are two oceanfront fishing piers along the Crystal Coast beaches that are wide open to anglers. The Bogue Inlet Pier is located in the town of Emerald Isle and is a 1,000 ft. long lighted fishing pier with a scenic observation deck, bathroom facilities, multiple fish cleaning stations, and a pier house store that’s stocked with bait, tackle, rods, reels, drinks and snacks. The Oceanana Fishing Pier is located in the town of Atlantic Beach and is a unique destination that’s also a resort with on-site accommodations. The pier also extends for 1,000 ft. into the ocean, and features a pier house restaurant that serves breakfast, lunch, and dinner, a tackle shop, and an adjacent private beach with a large children’s playground. Rates for either pier vary depending on the kind of fishing, (specifically, traditional fishing versus king mackerel fishing), as well as the duration of the pier pass. Sightseers are also welcome to explore the pier for incredible views of the respective Atlantic Beach or Emerald Isle shorelines. Offshore fishing is especially popular along the Crystal Coast, due to the shoreline’s inherent proximity to the Gulf Stream. Visitors can head to Beaufort, Morehead City, or even the soundside of Atlantic Beach to find a variety of offshore charter businesses that leave from the waterfront docks to the open ocean waters in a relatively brief trip that takes just an hour or two. Once anglers are in the warm Gulf Stream waters, the variety of huge game and trophy fish is nothing short of outstanding. Depending on the time of year, anglers can expect to reel in tasty game species including mahi, blackfin and yellowfin tuna, amberjack, wahoo, snapper, and king mackerel, as well as prized trophy fish including sailfish, blue marlin and white marlin. The summertime is arguably the best time for offshore fishing, as the billfish stick around for most of the summer months, and the game fish, (especially the tuna and Mahi), tend to be thick in the summer months as well. Rates for offshore charter fishing vary, but anglers can expect to spend $250-$300 per person for a full day of Gulf Stream fishing (not including the tip for the first mate.) The good news is that the sheer variety of catches, which can be cleaned and packed as soon as you arrive back to the docks, can provide enough fresh seafood for a whole vacation. Visitors who want a slightly offshore fishing experience without the excess cost can also embark on a headboat fishing trip. A headboat trip can accommodate a large number of anglers, (usually 20 or more), and cruises to barely offshore waters where the fishing is consistently solid. As a result, anglers have a great opportunity to land a variety of catches, including bluefish, Spanish mackerel, flounder, croaker, spot, and drum, depending on the season. There are several headboat options to choose from, which depart from the docks of Downtown Morehead City, Downtown Beaufort, and the soundside of Atlantic Beach. Check out established local fishing boats like the Crystal Coast Lady in Beaufort or Crystal Coast Adventures in Atlantic Beach for a wide variety of fishing trip options. The Crystal Coast shoreline is home to more than a dozen annual fishing tournaments which target all types of species, and which are open to anglers of all varieties. 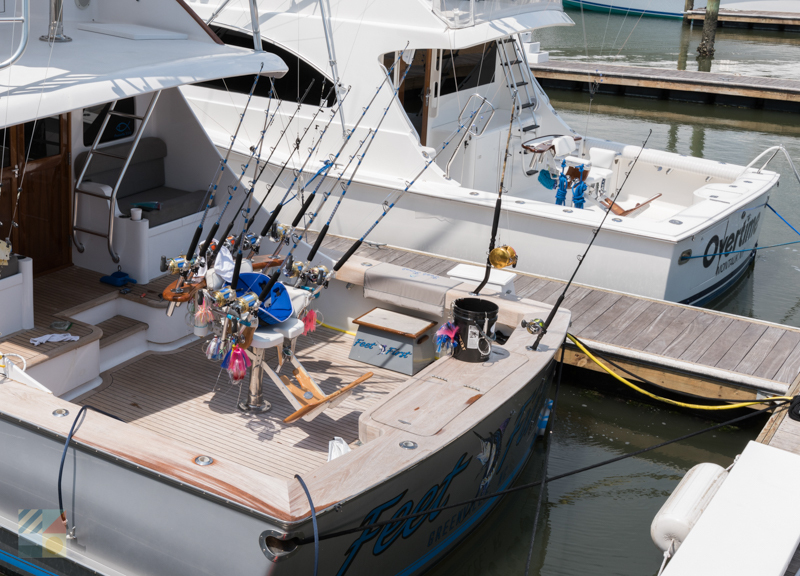 The annual Big Rock Blue Marlin tournament is easily one of the biggest offshore fishing tournaments on the Eastern Seaboard, and attracts anglers who compete for prizes in the $100,000+ range. Held during the first and / or second week of June, this tournament has a festival-style atmosphere, with a number of local businesses offering special after-hours entertainment, specials, and other incentives for tournament anglers and their friends. The early summer / late spring season is also when two locally established fishing tournaments are held – the Youth Fishing Derby and the BlueWater Fishing Tournament. 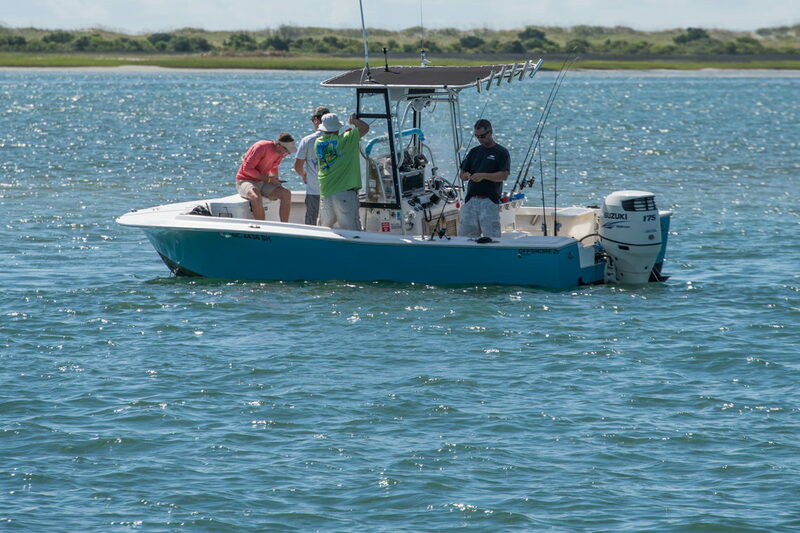 The Youth Fishing Derby is held on the Bogue Inlet Pier around Memorial Day, while the BlueWater Fishing Tournament Governor’s Cup Billfishing Series is headquartered in the town of Swansboro, and is held in late May. Summertime brings a series of offshore billfish tournaments as well as close-to-shore fishing tournaments. Anglers can compete in a number of king mackerel tournaments, such as the Cape Open King Mackerel Tournament and the RSWSC King Mackerel Tournament, which are typically held in late July, or can head to the Gulf Stream for major cash prizes in several tournaments that are part of the Governor’s Cup Billfishing Series. The surf fishing tournaments heat up again in the fall, with fishing tournaments that are dedicated to king mackerel fishing, flounder fishing, and speckled trout fishing. Visitors can learn more about all the upcoming tournaments that may coincide with an upcoming vacation by stopping by their favorite local tackle stores, or by heading to the Bogue or Oceana Fishing Piers. Advanced registration as well as an entry fee is often required, depending on the type of fishing tournament. It’s easy to catch your own bait, especially in the summertime. 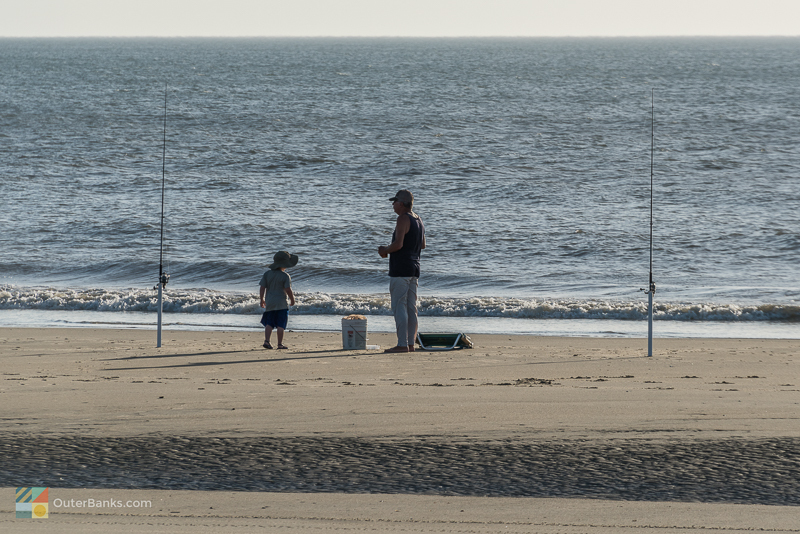 If you’re surf fishing, start digging in the wet sand close to the ocean wash to procure handfuls of “sand fleas” or “sand diggers” which are great bait for sea mullet, bluefish, and other summer catches. If you’re on the soundside, toss a cast net for small baiting mullet, which make an appearance in isolated areas close to salt marshes. Clamming, crabbing, and oyster digging are all fun and family-friendly ways to experience a new variety of fishing. Book a cruise or inshore trip, or rent a kayak, and start exploring the shallow and calm sound waters where these critters tend to congregate. Not only is the fall one of the best times to go fishing, it’s also one of the most inexpensive times to visit the Crystal Coast. Motels and vacation rentals often have seasonal rates, which means that accommodations are traditionally less expensive in the shoulder season or off-season months. If you don’t have gear, you can rent it. 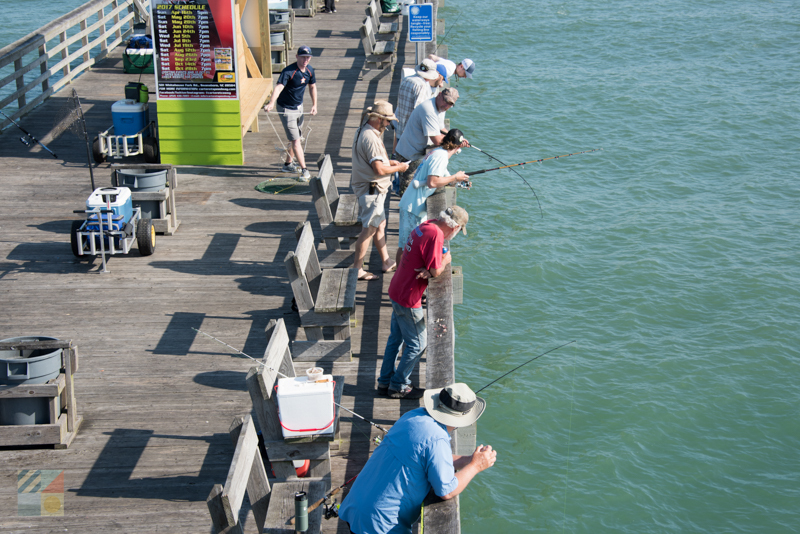 The Bogue Inlet pier has fishing rods and reels available to rent for visiting anglers for a nominal fee, while local watersports companies can rent out kayaks, small skiffs and fishing vessels, and even pontoon boats. Fishing isn’t just a sport – it’s a way of life on the Crystal Coast. From massive billfish tournaments and catches that break world records to lazy fall days when the red drum catch is hot, there’s a lot to discover and adore when it comes to fishing on the Crystal Coast.